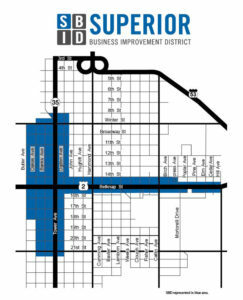 The Superior Business Improvement District advocates for its Stakeholders to sustain, promote and enhance the District. 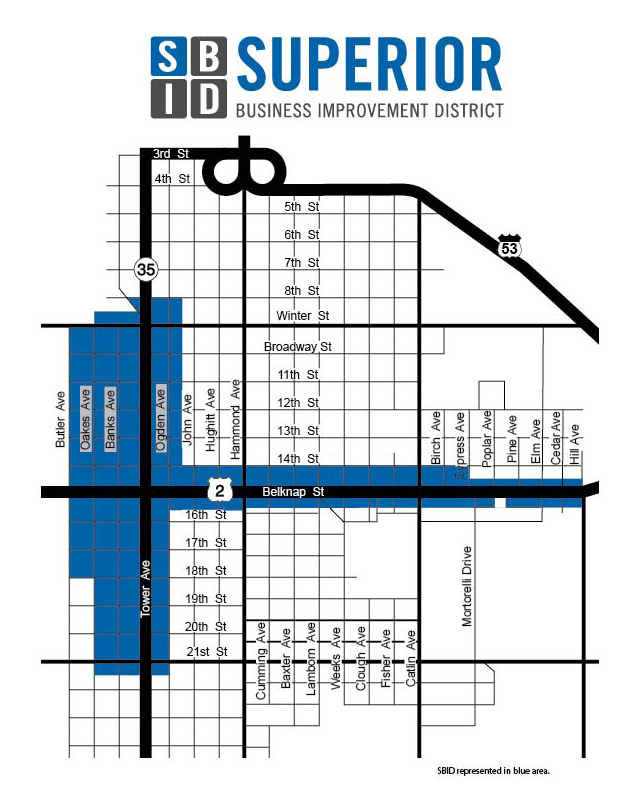 The Superior Business Improvement District seeks to foster unique and quality investment that makes the District a desired destination to conduct business, shop, dine and find entertainment. A business improvement district (BID) is a defined area within which businesses are required to pay an additional tax (or levy) in order to fund projects within the district’s boundaries. The BID is often funded primarily through the levy but can also draw on other public and private funding streams. BIDs may go by other names, such as business improvement area (BIA), business revitalization zone (BRZ), community improvement district (CID), special services area (SSA), or special improvement district (SID). These districts typically fund services which are perceived by some businesses as being inadequately performed by government with its existing tax revenues, such as cleaning streets, providing security, making capital improvements, construction of pedestrian and streetscape enhancements, and marketing the area. The services provided by BIDs are supplemental to those already provided by the municipality. When was the Superior BID established? How large is the BID? The SBID encompasses 89 blocks, 322 tax parcels with over 300 businesses. It is the largest BID in geographic size in the state of Wisconsin. Over 2,400 employees come into the BID on any given workday. Click here for printable map. How is the BID governed? The SBID has an eleven-member board with 51% of the members required to be commercial property owners or their representatives (Stakeholders). Board members serve one, two, or three year terms. The board is appointed by Superior’s mayor and approved by the City Council. What is the committee structure of the BID? There are currently 2 committees in the SBID beyond the Board of Directors. First is the SBID Design Committee. The Design Committee reviews and approves all grant applications and advises on areas that impact the BID sense of place. Second is the SBID Promotion Committee. This committee establishes and oversees marketing, promotions and events. Future committees that may be established are the Recruitment & Retention Committee and Education Committee. An assessment on commercial property with the SBID’s boundaries is the lion share of the budget. There are matching funds on the assessment total that come from the operations budget of the City of Superior and some donations are the funding sources for the SBID. The SBID continuously seeks grants for specific needs and opportunities for its Stakeholders. Are grant or loan programs available? The SBID currently offers two grants for its Stakeholders. The first grant is the SBID Matching Sign Grant where the SBID matches up to $1,000 towards the total cost of a sign. The second grant is the CDBG Matching Restoration Grant. The CDBG Matching Restoration Grant is a match up to $8,000 toward the overall cost of a project (façade, roof or exterior remodel) and abides by David Bacon-Act, prevailing wage laws. You may apply for either grant here.